The New York Times is now “evenhanded” about historical facts. Maybe Jewish history that has been continuously accepted for thousands of years and supported by overwhelming evidence is right, maybe the Muslims who are trying to destroy all evidence of Jewish history for political purposes are right. The question, which many books and scholarly treatises have never definitively answered, is whether the 37-acre site, home to Islam’s sacred Dome of the Rock shrine and Al Aqsa Mosque, was also the precise location of two ancient Jewish temples, one built on the remains of the other, and both long since gone. Those temples are integral to Jewish religious history and to Israel’s disputed assertions of sovereignty over all of Jerusalem. Many Palestinians, suspicious of Israel’s intentions for the site, have increasingly expressed doubt that the temples ever existed — at least in that location. Many Israelis regard such a challenge as false and inflammatory denialism. The writer, Rick Gladstone, is either dense or knowingly deceptive. Kent Bramlett, a professor of archaeology and history of antiquity at La Sierra University in Riverside, Calif., said historical records of the destruction committed by the Romans, just by themselves, are “pretty overwhelming” in supporting the existence of the second temple in the immediate vicinity of the Dome of the Rock. There is a huge difference between saying that we are not certain of the exact physical location and dimensions of the Temple buildings themselves, and saying that they were never built on the Temple Mount altogether, as the Arabs now claim and the New York Times is now saying is possible.. There is literally no doubt that the Second Temple existed on the Temple Mount. There are huge stairs on the southern end leading up to the Mount; there are impressive arches and gates still extant from Herodian times, the Herodian extensions on the Mount itself and retaining walls still exist, and there are many ritual baths outside the complex to ensure purity for those ascending to the Mount. 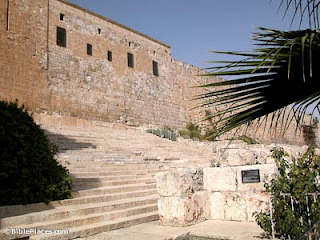 The Old City is not that large, and evidence from the Torah, New Testament, Josephus and even Roman officials testify as to the existence of a huge, impressive Temple in Jerusalem – there is literally nowhere else it could have been. While there is no archaeological evidence of the location of the First Temple, the idea that Jews returning after exile to rebuild it would not place it on the exact same spot is equally ludicrous. The New York Times, seizing on the uncertainty of the exact locations, is casting doubt on the existence of the Temples on the Mount altogether – and giving credence to Arab Temple denial. To say that there is a question as to “whether the 37-acre site… was also the precise location of two ancient Jewish temples” is a flat-out lie, and journalistic malpractice. And giving credibility to those who want to deny Jewish history is antisemitism. UPDATE: See also here and here.